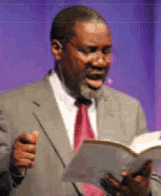 Conrad is the preaching pastor of HeartCry’s primary partner in Africa, Kabwata Baptist Church in Lusaka, Zambia. We have partnered with Kabwata Baptist for almost 13 years in helping to underwrite the support of their missionary pastors. The following is Pastor Conrad’s account of his conversion to Christ and his subsequent calling into the ministry. I was brought up in a religious family; hence, I always thought I was a Christian, as I went to church most of my life. The first time a person ever confronted me with the Gospel was while I was at Chiwala Secondary School. I refused to believe that I was not a Christian – especially because the student witnessing to me lived the same worldly and sinful life that I was living. Soon after completing school in December 1978, a friend of mine by the name of Fred Simposya, wrote me a letter in which he told me about the need for me to turn to God in repentance and put my faith in Jesus Christ. The contents of this letter hit me like a blow between the eyes. I recall that as I read it, I felt so convicted that I knew I needed to do something about my life. Instead of doing what the letter said, however, I convinced myself that all I needed to do was change my friends and become more regular at church. For three months, from January to March 1979, I tried to do this and failed lamentably. During this period, I was at Zambia National Service (ZNS) doing my compulsory military training. I discovered that sin was so much a part of me that I could not quit it on the whim of my will. While at ZNS, I was in the same block of residence as Fred and saw how, whereas I was trying and failing to live the Christian life, his Christian life just flowed “naturally”! Fred’s testimony was complemented by my elder sister’s. She was converted towards the end of 1978, and I was able to see the amazing change in her life. This was at a time when we were having a very difficult time in our home. My sister was ever joyful in the midst of our troubles, while I was always upset. I figured that this difference was because my sister had received something in her conversion experience that I did not have. So, these living testimonies set me searching for salvation despite my religious upbringing. It was not until the end of March that the search came to an end. On March 29th, I left ZNS for home with the express purpose of sorting out my relationship with God once and for all. On the way home, I bought myself a Bible. The following morning, when everyone had gone to work and school, I got Fred’s letter out and read it again. I noticed that he had directed me to pray to the Lord Jesus Christ to forgive and cleanse me. I looked for a prayer among the tracts in my sister’s room and found one that seemed to represent my plea. I knelt down and prayed that prayer twice over. Feeling no change, I threw it aside and cried to the Lord from the depth of my heart. It was not long before I felt the urge to pray disappear. I got up from my knees and wrote down in my new Bible: “Today, the 30th of March 1979, I, Conrad Mbewe, have accepted Jesus Christ as my personal Lord and Saviour.” Then I opened to the book of Ecclesiastes and read it from beginning to end. I was completely amazed that the Bible was so sweet to read. I went back to ZNS with a desire to tell everybody that Jesus saves. I found that my old sinful desires were gone, and I had new godly desires. I hated sin with the same intensity with which I once loved it. That is how I became a Christian. But how did I sense God’s call to the preaching ministry? Soon after my baptism, I began to have a strange experience. Often during my personal devotional exercises, especially while praying, I would feel a strong urge to go and preach the gospel to all who needed to get saved. At first I tried to overlook this feeling, but it grew with time until I finally decided to seek counsel. At this time, I was studying for my Mining Engineering degree at the University of Zambia. I went to the room of a Christian whom I admired for his godly life and his knowledge of the Bible, and I confided in him about this experience. I was hoping he would immediately tell me to quit my studies and go off to Bible College, but he did not. He counseled me that it was one thing to know the Lord’s call upon your life and it was another to know when it was that the Lord would have you to fulfill his call. So he advised me to get back to the Lord and respond to this growing burden upon my heart, and then to wait prayerfully until He opened the door for either training or ministry. That is precisely what I did. It was not until 1987, seven years later, that the Lord finally opened the door into pastoral ministry. It was in July of that year that Kabwata Baptist Church issued a call for me to become their pastor, and I commenced ministry there on September 1st of that year. The seven years of waiting were not spent looking into the sky wondering what to do with myself. I was involved in private theological studies and a growing preaching ministry, and my leadership gifts were exercised and developed in various ways. I recall one day a fellow student coming into my room during my last year of studies at university, looking at my bookshelf, and saying, “Conrad, tell me, what are you studying at this university? Looking at your bookshelf, one would think you are doing a Major in Theology and a Minor in Mining!” He was right. I had invested all the money I could spare on the kind of books I felt were recommended textbooks for theological students. These books were not just decorations on my shelf; I studied them, especially during my vacations and after I finished university and went to work in the mines. My leadership development largely took place at university. During my last two years of studies there, I was chosen to lead the University Christian Fellowship (UCF), which at that time had a membership of about 400 students on a campus of about 3000 students. Due to the different denominations represented in this group, I was stretched to the limit in terms of my leadership skills. During my last year at university, I was also chosen as the national student chairman for the Zambia Fellowship of Evangelical Students (ZAFES), which brought together an evangelical student witness in the university and college campuses across Zambia. Outside the university, I was also involved in the life of Lusaka Baptist Church, especially in leading the Bible study group for university and college students. (I also secretly was understudying the life and ministry of my pastor, Joe Simfukwe, seeking to learn from the way he managed his personal and ministry life how I would go about my work as a pastor when my turn came). I was also involved in the planting of Kabwata Baptist Church. We used to go out on Saturdays to evangelize door-to-door, and then invite people to church on Sunday. When I graduated in 1984 and went to work in the copper mining town of Mufulira, the church I joined immediately made me leader of the youth work. By the end of my first year in that church, the leaders had decided that I would preach every Sunday, as long as I was not working! Other churches began to call on me to preach for them too, so that by 1987 (the year I left to go into full time ministry), there was hardly a Sunday when I was not preaching somewhere. So, when the call came to pastor Kabwata Baptist Church, I was more than ready to throw aside my hard-hat and hold the plough with both hands.